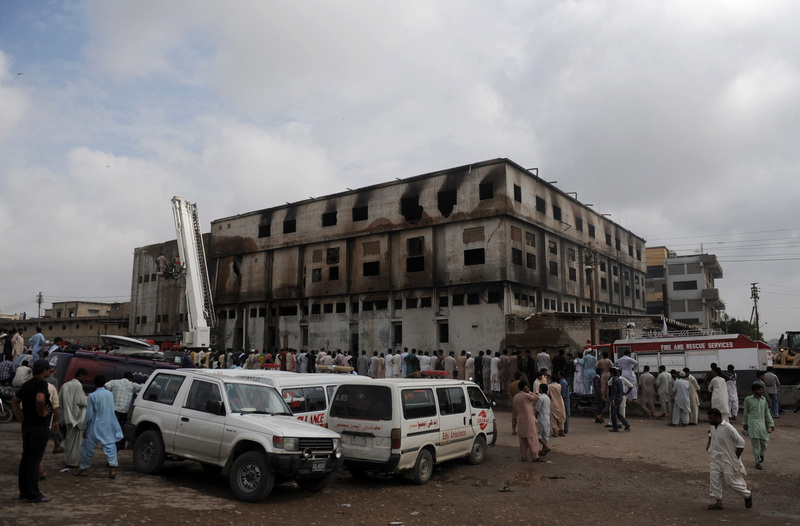 The heirs of the victims of Baldia Factory fire have demanded of the federal and provincial governments and international brands to fulfil their promises and ensure payment of the promised compensation to the victims. As per details, National Trade Union Federation, Baldia Factory Fire Affectees Association, held a big protest rally on Sunday that marched from the Regal Chowk to the Karachi Press Club (KPC). It was attended by a large number of the heirs of Shaheed workers including women and children. Addressing the rally, the speakers said that German brand KIK was still reluctant to pay the heirs of factory fire victims compensation as per ILO standards. They said the compensation as promised by the Pakistan Muslim League-Nawaz leader Nawaz Sharif and Bahria Foundation leader Malik Riaz were still to be fully paid. Addressing the rally, NTUF deputy general secretary Nasir Mansoor said the safety situation in their factories despite the tragedy of Baldia Factory fire had not improved. Their factories and industries were still sweatshops and torture places for workers, and resultantly industrial mishaps were happening continuously. Due to non-functional labour inspection, the occupational health and safety arrangements in factories are almost non-existent. Local industrialists and their international buyer companies feel it their right to violate local and international labour laws and standards. They suppress the right of labours to from their unions and earn huge profit by making quality products through cheap labour and selling them in American and European markets on huge profit margin. He said the German brand KIK responsible for the Baldia Factory fire had been delaying the talks for the last two years under various pretexts. Due to this, the heirs of five victims in the first phase have sent them legal notice through a German lawyer. After serving of this notice, the KIK is ready for talks but they are ready to pay the compensation as per the demand of the heirs. Similarly, five heirs are preparing to file a case in Italy against the Italian social audit company RINA that had issued the social audit certificate to Ali Enterprises. In this regard, a delegation of international lawyers would soon visit Pakistan to discuss the legal issues with the heirs soon. Moreover, a delegation of German lawyers and representatives of international labour organisations would visit Pakistan in February regarding filing a suit against KIK. PAKISTAN Workers Confederation (PWC) Vice President Rafiq Baloch said they had been raising voice against the violation of labours’ rights. He said the representatives of the European Union in Pakistan were being informed about the violation of labour rights as per the GSP+ status given to Pakistan. Workers Rights Movement leader Gul Rehman assured full support to the heirs of the martyred till their genuine demands were met. He said they would not allow turning factories and workplaces into Ali Enterprises. The rally participants through resolutions demanded that the German company KIK should pay Rs 0.5mn per family as interim relief and pay the final compensation as per the standards of ILO without further delay. RINA is equally responsible for this tragedy and it should also announce payment of compensation to the heirs. The compensation of Rs0.3mn per family as announced by Nawaz Sharif as opposition leader should be paid immediately, otherwise, a hunger strike protest camp would be established in January. The compensation of Rs 0.2million per family as announced by Malik Riaz has not paid to 92 heirs which should be urgently paid. Chief Minister Syed Qaim Ali Shah should implement his announcement of giving jobs to the heirs. A monument should be erected in the factory in the remembrance of the martyred workers. The government should ensure implementation of the accepted laws and standards as per the GSP+. The government should recognise the ILO convention 155 for occupational health and safety working environment and convention for occupational health service and make the provincial governments bound to make effective laws in this regard.